As Drew White, a bartender at Algonquin College’s student bar the Observatory, explains that Budweiser is the Ob’s most popular beer, a student sporting a black ball cap and baggy blue jeans arrives at the bar. “Can I get two Bud pints please?” the student asks. As White begins to pour the pints he smiles with his mouth shut at the coincidence and nods his head. The Observatory is one of three campus pubs for Ottawa students to unwind, or wind up at, after class. 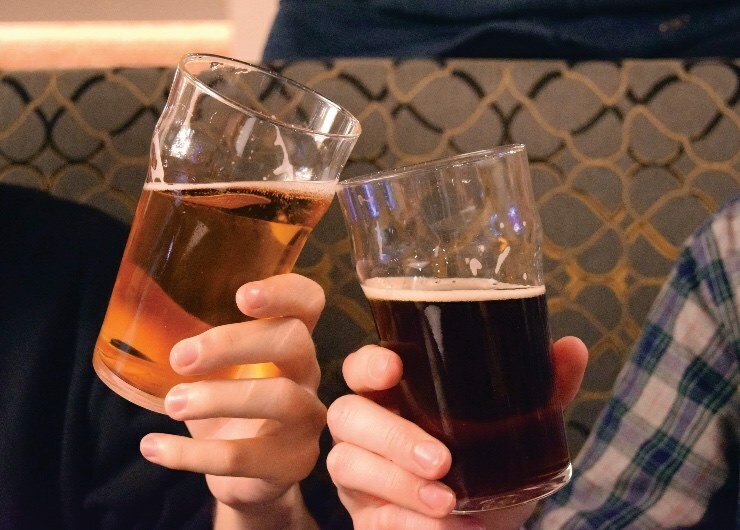 With Oliver’s pub at Carleton University, uOttawa’s 1848 and the Observatory at Algonquin, students get to choose from a variety of pub experiences available right on their campuses. The new semester is well on its way, and with it comes new stresses. Finding a place on campus to unwind after or before a big class can help students get through approaching deadlines and pressures post-secondary schooling puts on all of us. Claim to Fame: Thirsty Thursdays. Every Thursday, Oliver’s goes from pub to club. The front half of the bar is turned into a dance floor decked out with lights and a DJ who plays throwback jams and today’s top hits for students. The 19 plus event is a popular facet of Carleton’s campus life. Atmosphere: Ollie’s lighting and decor help it appeal to the average university student. Whether you’re sitting in one of the large booths in the front half, or the smaller tables in the back room, there’s ample space to sit and enjoy your drinks with friends without knocking elbows. Ollie’s isn’t just for the beer. The food options are affordable and include an all-day breakfast for the late risers. Music: Ollie’s plays a variety of music from classic hits to top 40 jams throughout the day. On Thirsty Thursdays, they pump up the crowd with sing along hits and songs perfect for a dance off with friends. Claim to Fame: Toonie Tuesdays. 1848 offers students two-dollar Fireball shots and half-priced Pabst Blue Ribbon every Tuesday. Similar to Ollie’s, uOttawa’s student pub brings in a DJ and makes room for a dance floor. Atmosphere: With seats at the bar and booths spread throughout, 1848 gives off a casual pub vibe. The large red pool table, something Ollie’s and The Observatory lack, is the first thing you notice as you walk in. Other than a game of pool, 1848 doesn’t seem too much like a sports bar, but rather a relaxing bar environment to study with friends or have a drink after class. Music: 1848 plays a variety of music from top 40 to classic rock. If you’re looking for a bite to eat during your visit at 1848, the food options are plentiful. With six appetizers and 11 meal options, 1848 has a variety of food for students to order and features discounted menu items on Mondays. Claim to Fame: While the Ob doesn’t have a day of the week that attracts large crowds, they host a variety events each month including Dirty Bingo and open mic nights. With drag queens as the hosts and giveaways ranging from condoms to dildos, Dirty Bingo attracts a large and rambunctious crowd to the Ob every second Wednesday of the month. Atmosphere: As students enter the Ob they can choose between the booths on the upper tier, stools lining the bar or chairs seated at tables on the main tier. Bright, modern lighting and sports on the TVs surrounding the pub gives The Ob a social, casual vibe that welcomes any student in for cold pint or a meal from the kitchen. Music: The Ob’s music keeps the atmosphere more laid back. Artists from Mumford and Sons to Michael Bublé play quietly in the background, appealing to a variety of music tastes without overshadowing visitors’ conversation. The Ob has plenty of food options for hungry students. Pub classics like nachos and burgers are available to-go or to bring back to your table. Vegan options are available for students too, making the Ob a great option for hungry students on their way to class or taking a study break. For the really adventurous, the Ob offers taco-in-a-bag: a bag filled with seasoned chicken and all of the available taco toppings you want.